Although it is a handicap, Newbury’s Hennessy Gold Cup has a long history of producing genuine Gold Cup contenders. Arkle and Mill House both won the race in the 1960’s with Denman and Bobs Worth continuing the trend in recent years. The weights have risen sharply following the defection of Tidal Bay and the betting market has focussed on the second season chasers with plenty of scope for improvement. Lord Windermere won The RSA Chase in March and Trainer Jim Culloty has been very positive during the build-up to the race. The bare form of the race suggests that he will need to improve a few pounds to win here but Culloty believes he can develop into a Gold Cup horse this season. Paul Nicholls has won this race as both a jockey and a trainer and he saddles the progressive Rocky Creek. The son of Dr Massini won three races last season including the Grade 2 Reynoldstown Chase at Ascot. Nicholls decided to avoid Cheltenham and ran him at Aintree where he finished third to Dynaste. Alan King’s Invictus was one of the top novice chasers in 2011 and included Bobs Worth and Silviniaco Conti among his victims when winning at Ascot. He suffered an injury shortly afterwards and must overcome a lengthy absence if he is to win this. David Pipe has his stable in fine form and followed up a Cheltenham four-timer with a big-race victory at Haydock last weekend. He is represented by Our Father has won first time out for the past three seasons. His subsequent efforts have not lived up to expectations but Pipe expects him to be at the top of his game for his seasonal debut. Nicky Henderson’s Hadrian’s Approach was third in the RSA Chase but may have been slightly closer but for a mistake 3 out. 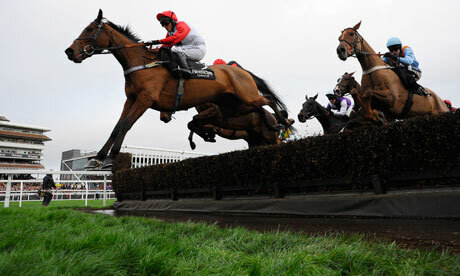 He has a habit of making costly jumping errors and cannot afford to do so in such a competitive race as this. Stable companion Triolo D’Alene was an impressive winner at Aintree last season and shaped promisingly last time when staying on into third. Emma Lavelle runs Highland Lodge who finished second in the Desert Orchid Chase at Wincanton behind Standing Ovation. He was an impressive winner at Cheltenham last December and has been well supported in the ante-post market. Merry King represents the Jonjo O’Neill/Richie McLernon combination who linked up to win the Paddy Power Gold Cup recently. He ran a promising race first time out when second to Houblon Des Obeaux at Ascot and is weighted to reverse the form here. He could represent a solid each-way choice at 12-1 with Bet365. Katenko missed the Cheltenham Gold Cup through injury and is on the comeback trail here for Venetia Williams. Willie Mullins and Ruby Walsh team up with Prince De Beauchene who has been fancied for the Grand National in the past two seasons but suffered an injury prior to the race on both occasions. Sue Smith has booked Richard Johnson to partner the promising Cloudy Too who was a most impressive winner at Carlisle at the start of the month. Donald McCain believes that Super Duty could be overpriced at around 20-1. He ran a great race when just touched off by Same Difference at the Cheltenham festival and has an each-way chance at the revised weights. Opening Batsman won a valuable prize at Kempton last season before disappointing on his final start whilst Theatre Guide runs in the colours of Cue Card, successful in Haydock’s Betfair Chase last Saturday.